In our store, we offer other images, sizes and framing options. Send us a message and we will be happy to accommodate your request. The photograph will be printed on Archival Photo Paper. Matted with a white 2 wide mat. Framed in a Mahogany frame with a classic 1 1/2 bead on the inside edge. With matting and framing, your 11 x 14 image measures 18 x 21. We provide quality images with colors that are historically accurate. Our goal is for each image to look as if it had been taken today. How Do We Do It? We start by digitally removing the image of damage to create a "clean" image. How Do We Select The Colors? We scour documents for descriptions. We search museum collections for reference items. We seek advice from experts in their fields. Hand tinting images has been popular from the beginning of Photography. Color brings out previously unnoticed details. The Past Was Lived In Color - We Want To See It In Color. This is an original, period image from the Library of Congress, the National Archives or other quality sources. It has been restored and tinted by the internationally known color artist and author of "Restoring and Tinting Vintage Images", David Richardson. This is a custom item that is being handcrafted for your order. Custis Lee (left) and aide Walter Taylor (right). 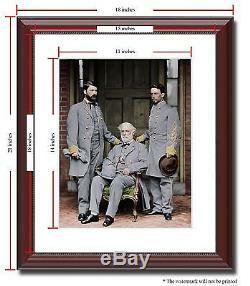 Two people close to Robert E. Lee during the Civil War were his son Custis (left) and his aide Walter Taylor (right). Custis was named George Washington Custis Lee to honor his mothers side of the family and her relationship to Martha (Custis) Washington. He followed in his fathers footsteps and entered West Point at the age of 17. His father became superintendent of West Point while Custis was in his third year and he graduated first in his class the following year. Custis followed his father into the Corps of Engineers and between 1854 and 1861 served in various positions in California, Georgia and Florida. By the start of the war, he was a First Lieutenant serving in Washington D. Two weeks after his father resigned, he also resigned and joined the Virginia militia. In August of 1861, he was appointed as aide-de-camp to Jefferson Davis and promoted to Colonel. He spent the next three years traveling to assess the condition of the Southern Army for Davis. In June of 1863, Custis was promoted to Brigadier General. While he longed for field command, he was discouraged by Jefferson Davis, but encouraged by his father. His father did give him the opportunity to command troops during Gettysburg. He was promoted to Major General while commanding troops during the defenses of Richmond in 1864. He was again commanding troops shortly before the end of the war and was captured three days before his father surrendered. During this period, he successfully sued the United States for confiscation of the Arlington Family estate during the war. Custis Lee died in 1913, at the age of 80. Walter Taylor had graduated from Virginia Military Institute and had become a Banker prior to the war. He joined the Confederate Army in 1861 and was assigned to the staff of Robert E.
The following year, when Lee became commander of the Army of Northern Virginia, Taylor became the assistant adjutant general. Serving as Lee's right hand - he would write dispatches, carry messages for the General and performed reconnaissance operations. At the age of 25, in 1863, he was promoted to Lieutenant Colonel. By this point, he was the gate keeper for Lee and would allow or deny visitors to the General. Taylor was given permission to marry just prior to the end of the war. He was married in Richmond just after midnight on the morning it fell to Federal troops. Evacuating with his wife to Southern lines, he stayed there until after Lees surrender. Due to his position on Lees staff, he was often called on to resolve disputes about conflicting accounts of the war. He was the first person given access to the National Archives to write his 1877 book, Four Years with General Lee. The book, due to its writing style that read like a military report, did not sell well. In 1906 he wrote a second book, Robert E. He died in 1916 at the age of 77. The item "Gen Robert E Lee son staff Confederate 11x14 Framed Photo Color Civil War -03114" is in sale since Friday, September 20, 2013. This item is in the category "Collectibles\Photographic Images\Vintage & Antique (Pre-1940)\Tintypes". The seller is "historyincolor" and is located in Los Angeles, CA. This item can be shipped to United States. Size Type/Largest Dimension: 18" x 21"